According to Gizmodo, Boston Dynamics is ending development of the BigDog robot because it is too noisy to be practical for the operations in which it was designed to be useful. The company has learned a lot from this design and plans to use features from it in future robots, but a robot that is designed to be useful to in field military operations can't be so loud that it gives up it's troops position to the enemy. Although I really wonder if the enemy is feeling too emboldened to attack a unit that has one of these bad boys running around on their side. I'd think the second BigDog was spotted, the enemies would be running away in the opposite direction is quickly as possible. Building a rope bridge with flying machines in the ETH Zurich Flying Machine Arena. The video shows quadrocopters autonomously assembling a rope bridge. This is part of a body of research in aerial construction, a field that addresses the construction of structures with the aid of flying machines. In this work, a rope bridge that can support the crossing of a person is built by quadrocopters, showing for the ﬁrst time that small ﬂying machines are capable of autonomously realizing load-bearing structures at full-scale and proceeding a step further towards real-world scenarios. Except for the required anchor points at both ends of the structure, the bridge consists exclusively of tensile elements and its connections and links are entirely realized by ﬂying machines. Spanning 7.4 m between two scaffolding structures, the bridge consists of nine rope segments for a total rope length of about 120 m and is composed of different elements, such as knots, links, and braids. The rope used for these experiments is made out of Dyneema, a material with a low weight-to-strength ratio and thus suitable for aerial construction. Of little weight (7 g per meter), a 4 mm diameter rope can sustain 1300 kg. The vehicles are equipped with a motorized spool that allows them to control the tension acting on the rope during deployment. A plastic tube guides the rope to the release point located between two propellers. The external forces and torques exerted on the quadrocopter by the rope during deployment are estimated and taken into account to achieve compliant ﬂight behavior. The assembly of the bridge is performed by small custom quadrocopters and builds upon the Flying Machine Arena, a research and demonstration platform for aerial robotics. The arena is equipped with a motion capture system that provides vehicle position and attitude measurements. Algorithms are run on a computer and commands are then sent to the ﬂying machines via a customized wireless infrastructure. In order to be able to design tensile structures that are buildable with flying robots, a series of computational tools have been developed, specifically addressing the characteristics of the building method. The design tools allow to simulate, sequence, and evaluate the structure before building. The location of the scaffolding structure is manually measured before starting the construction. The primary and bracing structure can then be realized without human intervention. Before realizing the stabilizers, the locations of the narrow openings of the bridge are measured and input to the system, which adapts the trajectories accordingly. This work is supported by and builds upon prior contributions by numerous collaborators in the Flying Machine Arena project. Seehttp://www.flyingmachinearena.org. This work was supported by the Hartmann Müller-Fonds on ETH Research Grant ETH-30 12-1 and by the SNSF (Swiss National Science Foundation). Man Hooks Up 54 Drones To Lawn Chair and Flies To Maker Heaven! The Swarm man carrying multi-rotor airborne flight testing montage. 54 counter-rotation propellers, six grouped control channels with KK2.15 stabilization. Take off weight 148kg, max lift, approx. 164kg. Endurance10 minutes. Power approx. 22KW. Just a bit of fun for my self, never intended for making a significant journey or flying much above head height. Approx cost £6000. Props at 18 in were the largest I could find with contra rotating pitches and so defines much of the layout. Also the fine pitch allows them to turn at high speed which reduces motor weight for a given power. Motor KV chosen to work with 4 cell batteries with 20% or so control margin. This low margin maximises the ESC efficiency, higher margin results in higher circulating current losses in the ESC and motor, reducing endurance. 54 chosen as this fits the hexagonal close pack layout. 6 more could be added in the centre. 18 in props at 5000 rpm though hazardous, are still much less so than 6, 5 ft ones. Where could you get a low power 5ft prop from weighing less than 1Kg with opposite pitches? The 54 gives good redundancy as mechanical and power electronic systems are the main failure areas. I have had one ESC randomly fail already. Controls could be made fully redundant (9 x KK2.15s) so only the control sticks (and pilot) are single failure points. Redundancy increases the likely hood of failure but reduces the consequences. Batteries, ESC and motor are close together to minimise wiring weight which is significant because of the high current 30A. Also the battery damps vibration. Individual batteries does mean some may run down a little quicker than others. The front and rear groups are used for pitching, a more common manoeuvre so far than roll. No one has spotted the biggest flaw! That is the large number of props running at high speed means the net torque reactions are relatively low, so the craft has little yaw authority. So it probably needs a tail rotor for spot turns. "the big-ticket item—the one that has already been reported sold out in Tokyo—isn’t from Hasbro, Mattel, or Lego. It’s an app-controlled miniature robot of BB-8 created by robotics company Sphero." Do not fly drones near birds of prey, they clearly attack seeing you as a threat or the right sized dinner. This will cost you money and potentially harm to the bird. This one was fine.. the drone needed some attention before it could fly again. If you see a bird of prey while flying. Land. I have added this to my operating procedure. Recently I posted that I wanted a Lily Drone. Well, after seeing footage filmed by another new drone company, I have to say I might want a HEXO+ drone instead. The HEXO+ drone is capable of auto-following and auto-filming you in whatever activity you want to be doing, whether it's skiing, surfing, kayaking, or running away a raging buffalo. 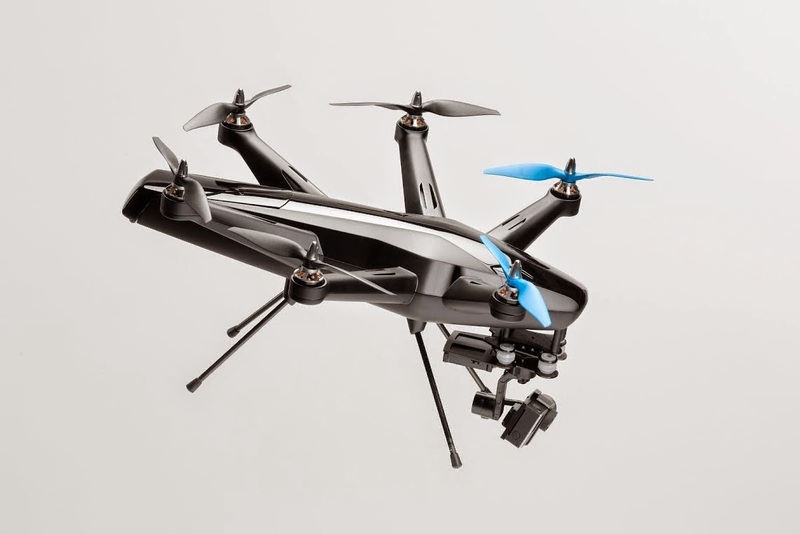 The Hexo+ is designed for everyone to take amazing Hollywood-style aerial shots and videos easily. Being able to fly at a maximum speed of 70km/h, the Hexo+ can be controlled with a few simple gestures on your smartphone. Their previous Kickstarter campaign has successfully raised over $1.3 million dollars with funding from more than 2,000 backers from across the world. Now they are taking pre-orders on their website hexoplus.com. The large scale delivery is planned to be in September. Using a cheap camera, a mobile robot, and a cloud-based object-recognition database, iRobot's system will be used to create in-home maps. The company is hoping its maps will be used by future home-automation platforms to improve Internet of Things ecosystems. I want a Lily Drone!!! The Defense Advanced Research Projects Agency (DARPA) is an agency of the United States Department of Defense responsible for the development of new technologies for use by the military. DARPA has been responsible for funding the development of many technologies which have had a major effect on the world, including computer networking, as well as NLS, which was both the first hypertext system, and an important precursor to the contemporary ubiquitous graphical user interface. DARPA’s original mission, established in 1958, was to prevent technological surprise like the launch of Sputnik, which signaled that the Soviets had beaten the U.S. into space. The mission statement has evolved over time. Today, DARPA’s mission is still to prevent technological surprise to the US, but also to create technological surprise for our enemies. ARPA was renamed to "DARPA" (for Defense) in March 1972, then renamed "ARPA" in February 1993, and then renamed "DARPA" again in March 1996. DARPA is independent from other more conventional military research and development and reports directly to senior Department of Defense management. DARPA has around 240 personnel (about 140 technical) directly managing a $3 billion budget. These figures are "on average" since DARPA focuses on short-term (two to four year) projects run by small, purpose-built teams. So keep an eye on this channel & Don't Forget To LIKE this video! The LOw-Cost Unmanned aerial vehicle Swarming Technology (LOCUST) is a prototype tube-launched UAV. The LOCUST program will make possible the launch of multiple swarming UAVs to autonomously overwhelm and adversary. New Robot from Boston Dynamics. Introducing Spot. Spot is a four-legged robot designed for indoor and outdoor operation. It is electrically powered and hydraulically actuated. Spot has a sensor head that helps it navigate and negotiate rough terrain. Spot weighs about 160 lbs. This video was just uploaded to YouTube today and it's great! Way to go Smith Brothers & SmithPixels.com! Video: 2017 FIRST Championship Announcement. Houston & Detroit will host dual championships starting in 2018. The Championships are going to move! Video: New DJI Phantom 3 Drone Shoots 4K Video! We’ve returned to the Phantom and have redesigned its core systems to bring you the most advanced, forward-thinking aerial videography solution the world has ever seen. The Phantom 3 takes the look and feel of big-budget professional image capture and puts it in the palm of your hand. Looking ahead to the 2015 FIRST Robotics Competition by looking back at what inspires us in FRC. Brain Farm paired a Phantom Flex4K with an Aerigon UAV to shoot the world's first Ultra High Definition, 4K aerial drone footage. The combination is a cinematic game changer. What does 1000 frames per second at 4K resolution translate to? Stunningly high-quality slow motion footage. Until now the images captured by the Phantom Flex 4K have been limited by the camera's weight. Simply put: It's too heavy for most drones to carry. Brain Farm, the production company that raised the cinematography bar in action sports filmmaking with the landmark movies, That's It, That's All, The Art of Flight and the soon-to-be-released We Are Blood, partnered with drone manufacturer Intuitive Aerial to develop a cinema-focused UAV system capable of carrying the camera. The result is what you see here: The world's first aerial footage shot from a UAV with a Phantom Flex4k. The world of options this technological combination will open up is about to break the ceiling of possibility in digital cinematic storytelling. This video features clips of Prior Lake High School FRC Robotics Team KING TeC #2169 and their robot competing in the 2015 FIRST Robotics Competition, Recycle Rush. The video shows the team progressing through the challenges in their first regional in Duluth, Minnesota as they learned the nuances of the game and the driving logistics of their newly created robot through their next tournament in Milwaukee where the team had improved considerably and ended up just missing the finals, but ended up winning a coveted award sponsored by NASA..
Here’s my blog post from their Duluth trip. Video of Sphero 2.0 --- The ball you control with your iPhone. Drive Your Dog Wild!! These are some clips of a few qualifying matches that occurred during the 2015 FRC Robotics Northern Lights Regional in Duluth, Minnesota. Our team is # 2169 KING TeC out of Prior Lake, Minnesota so much of the video is focused on them. It also has a few good clips of tournament champion team #525 and the impressive robot they built. These are some clips of a few qualifying matches that occurred during the 2015 FRC Robotics Wisconsin Regional in Milwaukee, Wisconsin. Our team is # 2169 KING TeC out of Prior Lake, Minnesota so much of the video is focused on them. It also has a few good clips of tournament champion team #2826 and the impressive robot they built.